I imagine that some of yours did too. Or could have. It’s true that my children enjoyed a family connection with Rabbi K, and that surely impacted how they thought of him. By virtue of my sister’s marrying into the Kaminetsky clan and the fact that Rabbi K was the actual Zaydie of their first cousins, it wasn’t much of a stretch. But he was a grandfatherly figure and elder statesman for a host of other reasons as well, most of which were not at all unique to any relationship or connection. I grew up in Teaneck in the late 70s and 80s. From his perch in the old shul in Bnai Yeshurun, and later from the center stage of the shul’s youth minyan, he taught us all how to daven and how to build a community. In his role as principal and director in local schools and camps, he showed us all how to lead and develop institutions and the people inside them. Long before he assumed the position of National Director of NCSY, he was the patriarch of one of the true cornerstone families in the organization’s history. I recall one Shabbaton for teens from diverse backgrounds where the Friday night program consisted of a recreation of the Kaminetsky Friday night table. The question was not why that would be meaningful to distant teens, but why we ever tried anything else to inspire the Jewish future. For an entire generation or two, we were his students and his grandchildren. He was an inspiration to the young community in Teaneck and to the global community of educators. An authentic Zaydie provides unconditional love and support while offering a bridge to our heritage and past. Few did this as well as Rabbi Kaminetsky. He was forever a loyal son and deeply committed to heritage and tradition. He transmitted both that love and that loyalty with indescribable warmth, respect, and clarity. 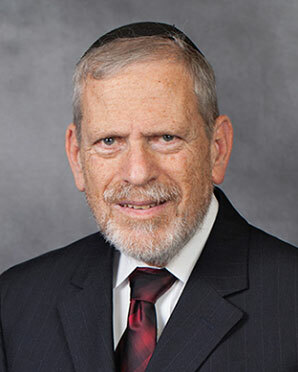 Beyond his kindness, his commitment to Torah and Tefilah, his extraordinary emphasis on family, and his craftsmanship as an educator, he owned two specific characteristics that have long captivated my attention. First, he was a man of remarkable efficiency. He loved to tinker and to improve, and to make things run better. Well before Waze and GPS, he delighted in traffic patterns and maps; getting from point A to point B was a never-ending challenge and riddle to maximize time and minimize effort. Systems and procedures were an art form. Lists and charts were reflections of an order and organization that defined his life. Second, Rabbi Kaminetsky lived a life of consistent simplicity. He had simple tastes and simple perspectives. Like anyone else, he faced challenges and struggles, and he had questions and personal dilemmas. But nothing was ever over-complicated or ambiguous. Directions and directives were always clear, and his life was uncluttered. It is increasingly obvious to me that these two points are deeply connected. Simplicity is not the mark of naiveté or shallow understanding. Indeed, simplicity can be a virtue when it allows us to whittle life down to its most essential components. The hallmark of Rabbi K’s legendary efficiency was a focus and prioritization that generated understanding of what matters and what does not. He knew exactly the secret to happiness and he understood perfectly well how things work and run at optimal vitality and vigor. And it was these things, and only these things, that he cared for and dedicated himself to. This was how he brought out the very best in so very many. His smile and his embrace drew strength from this focus and from the depth of understanding that only simplicity can reach. Our communal prayers are highlighted by the prayer of “kedusha.” In these special lines, we join the celestial beings in describing the greatness and glory of God. It is among the most lofty of prayers. On Shabbos we add to this vision with an expanded version that climaxes with the enchanting words of “mimkomcha,” and a picture of divine Kingship and a redeemed Jerusalem. It is no wonder that this prayer has been immortalized in song (and has become such a beloved favorite of chazzanim everywhere, including the Kaminetsky boys). The crescendo is reached with a reference to the eternal nature of this connection, and a stirring supplication for our own eyes to witness these processes. That should be the end. But it is not. The composer felt the need to add that these portrayals were first developed by King David, in beautiful poetry and song, and to introduce a quote from Psalms that seems to do little to bolster the imagery. This seems unnecessary and even out of place, given the sublime and transcendent subject matter. Fascinatingly, in most liturgical and musical interpretations of the paragraph, this concluding phrase is a somewhat awkward appendage. We will often end the song before concluding with words that don’t seem to fit the theme of what precedes them. What are David’s hands and workmanship doing in the Palace of the Almighty? Rav Hirsch (in his commentary to the siddur) already stresses the significance of the adjectives used for King David and his words. They are songs that depict “strength.” He is a chosen leader specifically due to his “righteousness” and goodness. Perhaps, God’s greatness and glory can remain inaccessible and beyond us, if we are bereft of David and his songs. Fortunately, we are led by Kings and Princes, and inspired by poets and songmen of deep strength and clarity of purpose. These individuals chart a course for us and our community, and it is through their efforts that we rise and soar. The climax is not in God’s incomprehensible might or in our hope to witness His revelation. It is much more real and tangible, and a prayer that reminds us of the inspiration and beauty that we witness today, through David and his beautiful legacy. We need our David and our Zaydie to gain access to the ultimate Royalty and to unlock our own greatness. We can look to prophetic visions for insights and answers, but a more direct path might be to consider the songs of David, in all of his righteousness. The late Moshe Yess, in arguably his most famous and important musical work, challenges the assimilated American Jewish community with the question of “who will be the Zaydie of our children?” His wonder is real, and the query is deliberately unanswered. When we feel such pain and loss, and when our Zaydie leaves us so suddenly, it is natural to ask the same and to feel orphaned and aimless. I personally already miss Zaydie Kaminetsky terribly. I miss walking with him (especially slowly but purposefully in Yerushalayim). I miss his steady guiding hand and his carefully chosen words of kinship and support. Most of all, I already miss our simcha dances and the radiating joy of his service. But Moshe Yess would be delighted to hear the ongoing harmony of Kaminetsky niggunim, the ceaseless echoes of Teaneck Youth Minyan songs, and the reverberations of our Zaydie’s life of song and devotion. In our version, the question is asked, and an answer can be suggested. Thanks to Rabbi K, WE will be the Zaydies of our children. His teachings and example have positioned us to take the mantle of leadership in our homes and our shuls, and to live up to his expectations for us. In the case of his growing family and great grandchildren, we are new Zaydies on a literal level. For the greater community, we continue to march forward and thrive, and reward his boundless confidence in our people. The Davidic dynasty lives- and continues to shape our lives.